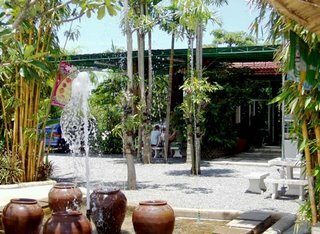 One of the restaurants we visit most often is Leelawadee, situated on the road between Wat Chalong and Phuket Town, next to the Kajonkiet School, about 3km from the Central Festival Mall. 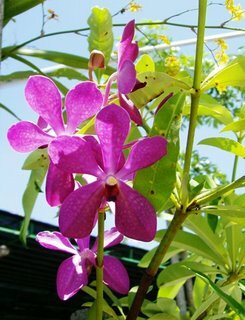 Despite being by the main road, it is a quiet place, full of plants and flowers, with a pond outside full of fish. Service is friendly (note they do not speak much English), food is inexpensive. The menu has everything from Thai salads (the Yam Neua - Beef Salad - is great) to pizza (only 90 Baht) and club sandwiches. 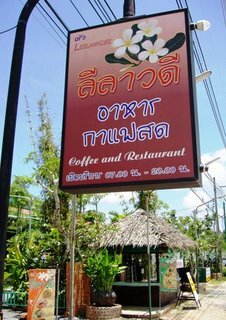 They also do breakfasts but the sausages and ham are Thai style (not great). Coffee tastes good here. Cold beers in the fridge. Tables inside and outside. Update August 2008 - we still eat here, though prices have gone up quite a bit since 2006 especially the pizza! Update again 2013, we've been a couple of times recently and I think I need to re-blog .. it's quite popular in the evening with Thai people and the food is GOOD!